We are ending our live coverage but you can keep up to date with developments in our news story. Leading Eurosceptics have blamed the Schengen agreement, which allows passport-free travel between many European Union states, for Anis Amri's easy journey across Europe. The Berlin truck attack suspect travelled by train from Germany to France and on to Italy, where he was killed in a shoot-out with police. Marine Le Pen, who leads France's far-right National Front party, said: "This escapade in at least two or three countries is symptomatic of the total security catastrophe that is the Schengen agreement." Former UKIP leader Nigel Farage said on Twitter: "If the man shot in Milan is the Berlin killer, then the Schengen Area is proven to be a risk to public safety. It must go." Security around the UK has been stepped up after the Berlin attack. In London, roads will be closed around Buckingham Palace during the changing of the guard ceremony, while armed officers will be on duty in Newcastle, the East Midlands and other cities around the country. Police had no information that Anis Amri might have travelled to Milan, the city's police chief says. Reports have suggested that patrols in the city were stepped up following a tip-off that the Berlin market attack suspect might be in the area. But Antonio De Iesu said the officers who encountered Amri were on a routine patrol. "We had no intelligence that he could be in Milan," he told reporters. "They had no perception that it could be him otherwise they would have been much more cautious." 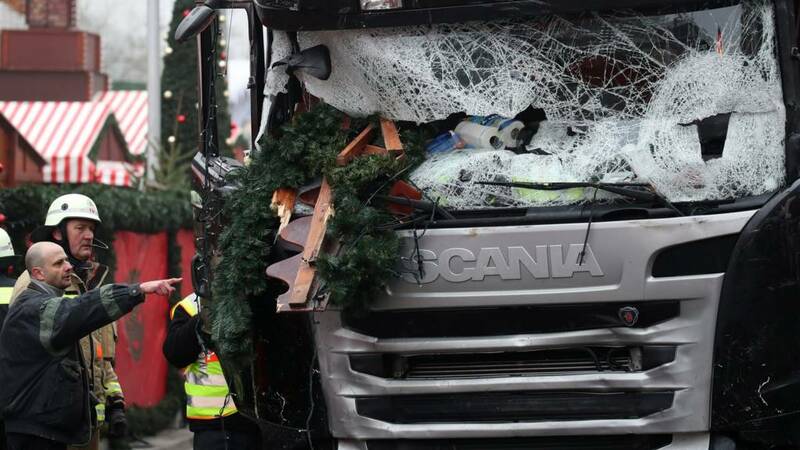 A campaign to raise money for the family of the Polish lorry driver Lukasz Urban, who died in Monday's attack, has gained more than £50,000 in donations. The online crowdfunding push was started by "fellow trucker" Dave Duncan from Otley, West Yorkshire, with 3,700 people offering money. Did Amri have any accomplices? German's federal prosecutor, Peter Frank, has told a news conference that investigators are still trying to determine whether Anis Amri had help from any accomplices. A new terror alert has been sparked in Germany after two men were arrested on suspicion of planning an attack on a shopping centre in Oberhausen near the Dutch border. The brothers, aged 31 and 28 and born in Kosovo, were detained early on Friday in Duisburg, police say. Berlin police have tweeted their thanks to their Italian counterparts, following the shoot-out in Milan in which Berlin Christmas market attack suspect Anis Amri was killed. "Thanks and a speedy recovery to our wounded colleagues," said the tweet in Italian and German on the Berlin Police twitter feed. The BBC's Damien McGuinness has been looking at the impact of the Berlin attack on life there. For many Berliners, the one word most associated with their city is "freedom". So when Berlin Mayor Michael Mueller called this tragedy an "attack on our freedom", he meant an attack on the essential character of this city. You can read more of Damien's article here. The parents of Italian trainee police officer Luca Scata, who shot Anis Amri, have told Italian news agency Ansa that they are "extremely proud" of him. Anis Amri's mother has hit out at European authorities following the shooting of her son in Milan. “The security people in Italy and Germany are also partly responsible,” Nour El Houda Hassani said in an interview with German newspaper Deutsche Welle from her home in Tunisia. "They had already caught him two or three times [before the Berlin attack]. Why did they not send him back to Tunisia? Why was he not sentenced? Why was he not arrested?" She added: “It hurts so much. How could such a thing happen? I feel so bad for the innocents and also for my son." Italian Prime Minister Paolo Gentiloni has praised the two young officers involved in the shoot-out. "Italy is proud of its security forces," he was quoted as saying by La Stampa website. "We're especially grateful to the young officer on probation Cristian Movio, who was wounded, and to his colleague Luca Scata. The officers demonstrated outstanding courage and professionalism." This BBC map shows the site of the shootout that killed Anis Amri outside the Sesto San Giovanni train station.Image caption: This BBC map shows the site of the shootout that killed Anis Amri outside the Sesto San Giovanni train station. "It could have been luck but I suspect it was more of a tip-off." Police had stepped up patrols in Milan following a tip off that Amri might be in the area, judicial sources quoted by Reuters say. Details have started to emerge of some of the people who lost their lives in Monday's attack. They included Polish lorry driver Lukasz Urban, Israeli tourist Dalia Elyakim and Italian expatriate Fabrizia di Lorenzo.